Entrenched secrets, mysterious spirits, and an astonishing friendship weave together in this extraordinary and haunting debut.Nothing matters. Only Bird matters. And he flew away. Jewel never knew her brother Bird, but all her life she has lived in his shadow. Her parents blame Grandpa for the tragedy of their family�s past; they say that Grandpa attracted a malevolent spirit�a duppy�into their home. Grandpa hasn�t spoken a word since. Now Jewel is twelve, and she lives in a house full of secrets and impenetrable silence. Jewel is sure that no one will ever love her like they loved Bird, until the night that she meets a mysterious boy in a tree. Grandpa is convinced that the boy is a duppy, but Jewel knows that he is something more. And that maybe�just maybe�the time has come to break through the stagnant silence of the past. I think that there is something kind of touching and kind of sweet when middle grade books take on the topic and theme of death. These books seem to handle death with a quiet sort of grace that’s comforting, as awkward as that whole sentence sounds. I mean, I still remember the first book I read that really dealt with dying and that was�Bridge To Terebithia. I suppose it just feels more real to me in a middle grade book, at a child’s level, than it does with a young adult book. And so, when I got the opportunity to listen to�Bird by Crystal Chan, I kind of jumped at it, as much of the story centers around a family’s grief. Also? Amandla Stenberg aka Rue from�The Hunger Games�is the audiobook narrator. On the day that main character Jewel was born, her older brother, John, also known as Bird died by jumping off a cliff. Jewel’s family blames her grandfather for giving him the nickname bird, and so overcome by grief, her grandfather does not speak. In fact, Jewel has never heard him speak. Jewel’s parents seem to resent her as they are also still lost in their grief. Jewel leads a bit of a lonely life, until one day everything changes when she meets this boy, John, in a tree. He becomes a bit of a best friend for her and she discovers that she really does not have to be alone. John is dealing with his own issues, too. There’s also interesting folklore in Crystal Chan’s�Bird, namely these spirits called duppys which you totally need to watch out for. Now, I am being a bit flip and this is totally not one of those flip books, it’s actually really serious you guys. How Is Jewel As A Character? Jewel is kind of really smart for a twelve year old. She reminds me of kids from books I read as a kid, in that she’s independent and not annoying. She handles herself well. It’s really hard on her having parents who seem to not want her, but she’s not the sort that acts out and throws temper tantrums. Instead, she does kid things. Actually, I kind of liked reading about Jewel because it reminded me of what it was like to be a powerless kid. Also? She has this passion for soil and wants to be a geologist. So cool. How Does Bird Deal With Grief? As someone who has not dealt with a lot of grief in my life, thank goodness, I thought that�Bird did a decent job dealing with the sadness of death. I liked that it showed how empty one can feel after a senseless death. It shows the blame and the guilt. It shows how the silence of pain can really eat away at you. It also shows that after loss, there’s a way to recover and move forward past what has happened, it’s just kind of hard to get there. I thought that Amandla Stenberg’s narration felt authentic. 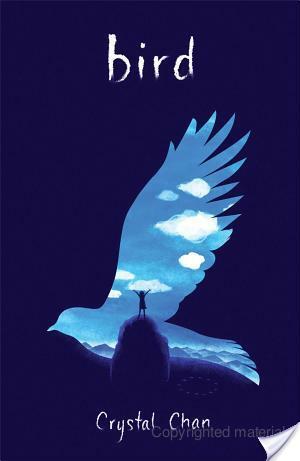 I think children will like the audiobook of�Bird because it is an actual child reading it. While I wish that she had used different voices for the characters, I thought she did a good job. I thought she had the right amount of emotion and feeling in her voice. Is Stenberg the best narrator ever? No, but this is not a terrible audiobook. It’s a good listen if you’re in the mood for a sad and serious book. That caption is the book in one sentence. I haven’t seen the audiobook of this one yet! I’m intrigued. And Rue reads it? Wow! Sounds like a sad but worthwhile read. I really enjoyed this book when I read it earlier this year. It would be really interesting to hear it being read. I think it’s a very powerful book for middle grade! I have a very hard time read books about grief, but I have read a few, and I agree that those middle grade books about grief can be really special. I’m not sure if I will run off and read this one, but I’m glad you liked it. Have you read The Tiger Rising by Kate DiCamillo? That’s a wonderful MG about grief. I love that you review such a large variety you books! I tend to stay away from a lot of grief books, but I do love the way Middle Grade handles issues. This sounds like it has a little magical realism in it? Or maybe it doesn’t, but you’ve definitely peaked my interest about what is going on. I’d like to meet Jewel. I think you said it perfectly when you said that middle grade fiction “handles death with a quiet sort of grace.” I’ve always enjoyed the way themes of death are addressed in books for the younger crowd. The cover for Bird is beautiful! And I do like that this is a book for younger readers that deals with grief, and in a unique way. I’ll admit to now being really curious about it myself. Hopefully, I get a chance to read it soon!